Figure 4.28. Integrated PDRE ram-scramjet combined cycle. 14. Pulse detonation rocket/ramjet-scramjet engine. Figure 4.28 shows a Russian concept for a PDE/ramjet/ODWE equivalent to a rocket-ram-scramjet system as described in [Kailasanath, 2002]. The PDE module is shown integrated into a blended body airbreathing configuration much as a rocket ejector ramjet-scramjet is integrated. Except for the pulsed nature of the ejector strut operation, the engine is essentially a rocket ejector ramjet. The PDRE operation is confined to the strut in low-speed phase of the operation. The engine spans the operational envelope from takeoff to perhaps a little above Mach 15. 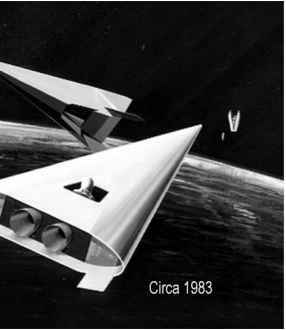 For the PDE engine above Mach 6 flight the propulsion configuration is an airbreathing PDE that incorporates elements of the rocket PDE, with the kinetic compression of the rocket ejector ramjet producing a pulsed detonation wave within a steady flow device. This concept is equivalent to a LACE or deeply cooled airbreathing rocket. For speed greater than Mach 6, the propulsion converts to a steady-state operation as an oblique detonation wave engine (ODWE), as it is necessary to transition the detonation wave from an oscillation detonation wave structure to a steady oblique detonation wave structure. In this operating mode it is equivalent to a scramjet [Kailasanath, 2002]. In this latter mode the engine operates in a continuous detonation process and is now a steady-state engine. Above the maximum airbreathing speed the PDR provides the thrust to orbital velocity. A representative installation in an airbreathing configuration is shown at the top of Figure 4.28. Externally there is little difference in the configuration from the conventional scramjet configuration except for perhaps a longer engine cowl. The pulse detonation propulsion systems offer considerable promise in reduced weight and propellant pumping challenges. The PDRE are in a period of experimentation and development. The question remains: Can the eventual operational hardware developed capture the promise shown in the analytical studies? In this chapter we assume the operational hardware has captured the promised performance so a valid measure of the potential is presented.